A unique New York City mother/daughter team plays out some of life's special moments in music and song. The crowd at The Pangea was in for a real treat when a unique mother/daughter act from the neighborhood performed a number of musical selections complete with stories that were nostalgic to this quaint, historic community on the Lower East Side. 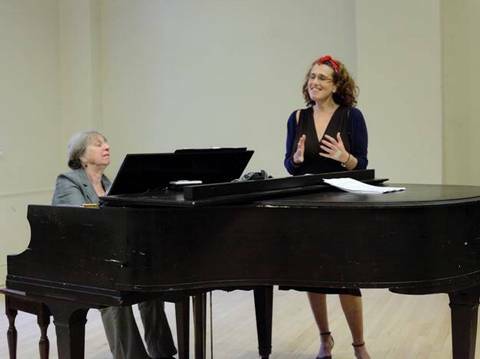 Mimi Stern-Wolfe began the 90-minute cabaret by recounting the tale of a Russian immigrant from the old days who used to come in from the Bronx to frequent the nearby Yiddish Theater. He went by the name of Bronstein. After a time, he left to go back to Russia to, as he put it, overthrow Kerensky. He turned out to be none other than Leon Trotsky. The theater later became the Children’s Musical Theater where a little girl named Laura Wolfe took to the stage and a star was born. When her mother had finished telling her story Laura Wolfe, now all grown up, burst into song with “City Child,” a composition of her own making that describes what life was like for her growing up in the big city. Featured on her CD, SIREN, she dedicated it to the Cafe Royale which, between 1911 and 1953, was a hot spot on the SE corner of 12th Street and Second Avenue for writers, composers and orators as well as Yiddish actors, Hebrew unionists and others who used it as a platform to discuss unions, socialism, work, life in New York City, and their hopes and dreams. This place holds a lot of significance for Mimi and and Laura who lived in the building for 10 years. Also, the man named Bronstein spent a lot of time there before going back to his native Russia. Given this setting, some might find it interesting to note that Laura’s father was one of the Weathermen, which was an extremely controversial political group back in the ’60s and ’70s. Continuing on in the Yiddish tradition, the Wolfe women chose Morris Winchevsky’s “Ale Brider” (“All Brothers”) for their second number. They also performed “Rozhinkes Mit Mandlen” (“Raisins and Almonds”),” from the operetta Shulamis,” by Abraham Goldfaden, the Father of Yiddish Theater, and “Rondeau Redouble” which owes its poetic lyrics to the one and only Dorothy Parker but was put to music by their late friend William Turner who succumbed to AIDS. Not all the songs were about the old neighborhood, though. A variety of music was embraced but it all had special meaning for the performers and, if there was a theme, that was it. Each song held significance for them and reflected their eclectic tastes. Every year since 1990 through her Benson AIDS Series which is dedicated to her late friend, composer Eric Benson, Mimi has performed music in tribute to artists whose lives have been cut short due to AIDS and whose music may have been forever lost to the public were it not for her concert series keeping it alive. Usually she performs the concert on December 1st, World AIDS Day, but she brought attention to their music in this one-night only performance at The Pangea when she featured William Turner’s work. Some of the other highlights of the night included Mimi’s solo piano performance of George Gershwin’s “Somebody Loves Me,” and Laura’s interpretation of Joni Mitchell’s “River” and “Blue.” A standout, though, was Cole Porter’s “Night and Day,” which one could tell was very personal to Laura who, in a very tender, heartfelt voice, sang to her “honey” in the audience. It was very touching. The two artists also offered up some of their own compositions. Besides “City Child,” Laura sang, “I Believe,” “You and Me,” and “Wording of Things,” among others. Mimi performed her “Let Your Walls Crumble” and “No More Moaning,” which was the finale. There were 17 songs in all and they were all sung with great feeling. Mimi made a wonderful piano accompanist for her daughter, Laura, whose vocals reached into the depths of the soul, exposing vulnerability, innocence and raw talent. It filled the room. You could feel their passion; it was in their music, in their vocals, and in their body movements. You could also feel their joy, the kind only a mother and daughter can share. It was refreshing and delighted the audience so much that many found themselves pausing in-between sips of wine and mouthfuls of pasta to look up from the tiny round tables where they sat to take it all in. Both artists are multi-talented. In addition to being an accomplished pianist, Mimi is a producer, conductor and composer. She holds a Masters in Music from the New York Conservatory and is the Director of Downtown Music Productions. She performs concerts for ground-breaking events like the 1990 tribute to “Composers of the Holocaust” and her annual Benson AIDS Series. The East Village Cinema, which at some point took over the Children’s Musical Theater, devoted a week to showing a documentary film directed by Australia’s Rohan Spong called “All the Way through Evening” about this AIDS Series. Among her many other achievements, Mimi has received a number of awards including a Mayor’s “Arts Award in Music” for her “exceptional contribution to the arts and multicultural life of NYC” and the 2014 Lower East Side Community Hero Award. Laura was born into a musically-talented family and she is not only a vocalist and songwriter but plays a number of instruments as well, including the guitar which she strummed during the December 14 performance at The Pangea. She has been compared with Carol King and Laura Nyro and is remarkably versatile. In addition to her solo concerts, she has sung with the synagogue group “Romemu,” gospel choirs, East Indian groups, and the European Tour of Broadway’s Hair among others and has released several albums. Commenting on it all, Laura said, “Music shaped every aspect of my life….I think I sang before I even spoke.” No wonder she is so good. The two New York originals were a delight. They were not only entertaining, they were inspiring. If you were lucky enough to be there, then you were blessed. If you missed this one-night only show at The Pangea and would like to hear the Wolfes perform, you will have to be on the lookout for their next show or pick up one of their CDs.